Discussion in 'General Idea Discussion' started by Vocaloiid, Feb 9, 2019. PapiKirito and Shaiym like this. I think this would be interesting and a lot more understandable if implemented. However, because people are used to the way traditional mathematics works I doubt that this would be implemented due to the potential confusion it may cause. As Shaiym said above, the current IGT display has been on the network for a while and changing it might be very confusing for players. Although personally, I agree with the suggestion I do not think that it is necessary enough to implement, and it may cause some disagreements within the community. Glad to see you trying regardless, and good luck! I don’t worry too much about this in game time stuff, but I’ve noticed it quite difficult to understand. I support you, but there’s a lot I don’t know. Not the most reliable vote, but hey, it’s something. @TsunamiSurvivor . @Fall @ireallylikerats @spacexplorer_ @Shaiym updated the idea. If you could revise your comments to what you now think about the idea. Vocaloiid, Wiz_Techno and aolei like this. I've already said this in GI but I'd rather we kept the time as it is. The current system makes sense because 24 is divided into 10 so it all works out. 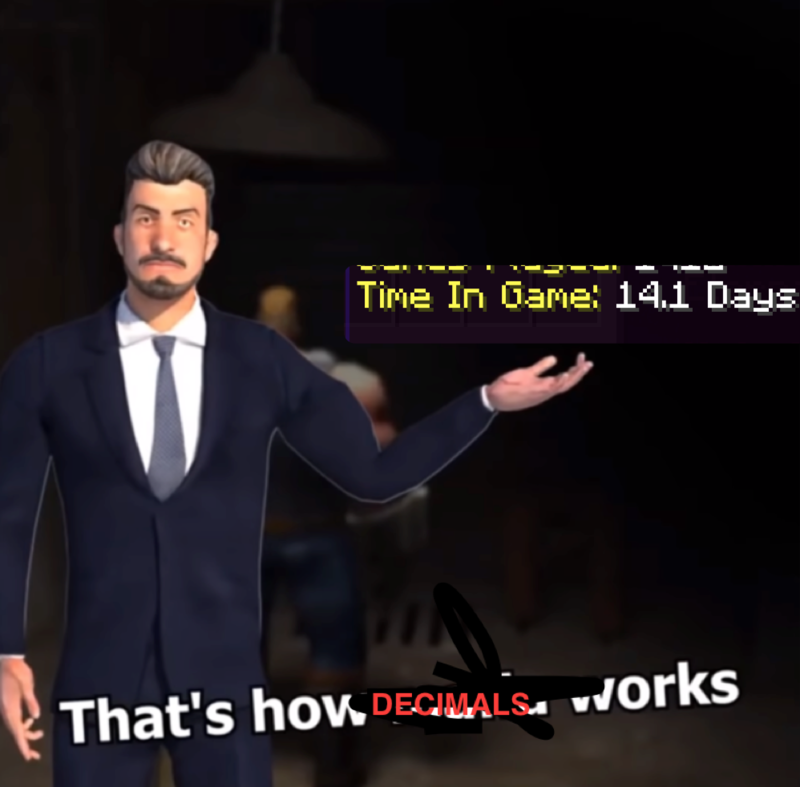 That's how decimals work. So -1 on the current idea at hand but I'd love to see instead of decimals just x days and y minutes. Please forgive for the bad meme I have no time to do this stuff anymore. Combativeness/xWorpp, Jaekub and Vocaloiid like this. I love this idea. I love to check my IGT and I think this would make it much easier to understand IGT. I personally think that this would make people more likely to check their IGT, since it would be much easier to understand. Overall, I think this is a great change and if implemented, it would encourage more people to check their IGT since it would be easier to understand. Yes please. This isn't a large change by any means, but it makes so much more sense to have it this way than the decimals. I've never personally liked the decimals. I feel this would also help the staff team some. I know that when I was on Trainee Management (rip), my mentees had in-game time quotas to reach and it would be really unfortunate to say someone didn't meet their quota if they were just shy of going up. I'm sure it happened but there was no way to tell if they played the extra two hours or not. This idea is not good at all! The decimal system is perfectly fine as it is. Can you explain how / why? Hii! I definitely think that this would be a great change. Especially considering the decimal for the days is even more confusing because .1 days is 2.4 hours and that conversion isn't the easiest to comprehend when there are larger numbers. This would just allow for it to take up about the same amount of space on one line and look a bit more condensed. The idea does pose some other accommodations considering IGT is used for activity on the staff team, and quotas are in terms of days, but that could easily be converted into hours to fit in with the new look of it, so I don't think it would be a big thing to quickly fix. Overall, this definitely would just make it a little bit easier to comprehend, and I think it would be a nice addition! That's actually NOT how decimals work. It would be splitting 1 day into 24 parts (hours), meaning each hour is approximately .0416666666666666666666666666666666666666666666666666666666666666666666666666666666666666666666666666666666666666666666666666666666666666666666666666666666666666666666666666666666666666666666666666666666666666666666666666666666666666666666666666666666666666666666666 days. So no, it does not appear as a finite decimal. (Yes I enjoy doing math for fun). Definitely not 100% necessary but will keep this mind for whenever we add some QoL changes. Thanks for the suggestion! Feel free to DM me if you have any questions or concerns. Vocaloiid and Shaiym like this.